Alerts provide instructions for setting custom Tradingview alerts. The ability to add alerts to all of the SWING•GENIE indicators has now been implemented. These alerts are embedded and specific to these SWING•GENIE indicators. They must be set using the fellowing instructions and the generic or global alerts that are provided will not activate them. These indicators focus on the primary signals each of the indicators generate. For the Cycles indicator the primary entry and exit signals that produce green and red dots can now generate alerts. The Early Warning System dots that provide advanced indication of turning points have also been set up for alerts. Finally the Volume Price Projection indicator is now set up to signal alerts that the volume is spiking relative to a normal moving average. • Right Click √ on you price chart (shown above) and the resulting dialog box will allow you click on √ "Add Alert." • You will now see the Alert configuration panel shown on below on the left. [A] You want to use the drop down menu embedded in the "Condition" window that will initically show your ticker symbol. This is shown on the left . [A] This drop down window allows you to select the specific indicator you want to select an alert for. [B] is a seconday condition and does not need to be changed for custom embedded alerts. 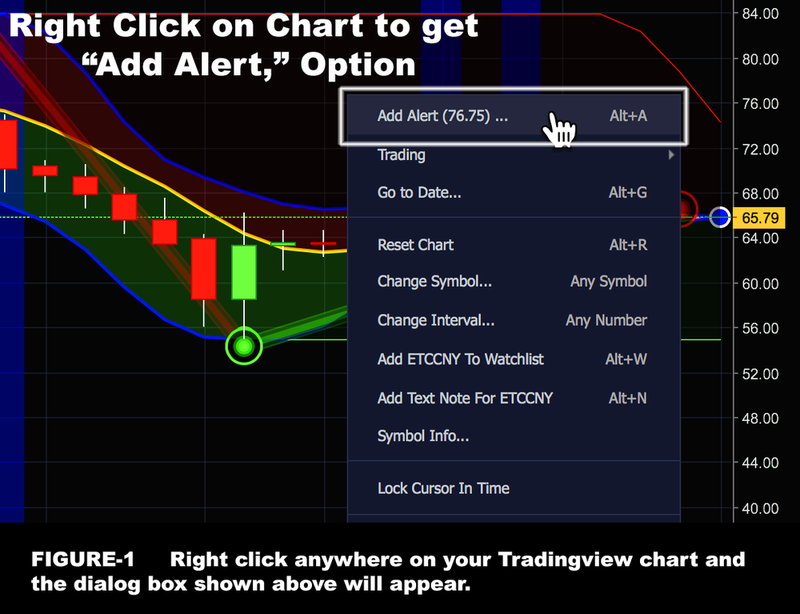 [C] Allows you to select one of the alerts programed into this indicator. These options for this indicator [D] will all be in all caps. [D] The ALERTS at the top of this list will all be in CAPITAL letters for the SWING•GENIE indicator alerts. [F] Expiration time allows you to determine how long this alert will run. [G] Alert Actions, allows for the selection of the types of alerts on you primary trading platform and also lets you select alternative messagle to be delivered by phone, text or email. [H] Message are a customizable text block that will make your alerts more meaningful. Example of all ALERT dialog boxes are shown below. Each indicator’s ALERT text is also shown. The ALERTS below are for the fellowing SWING•GENIE Indicators.